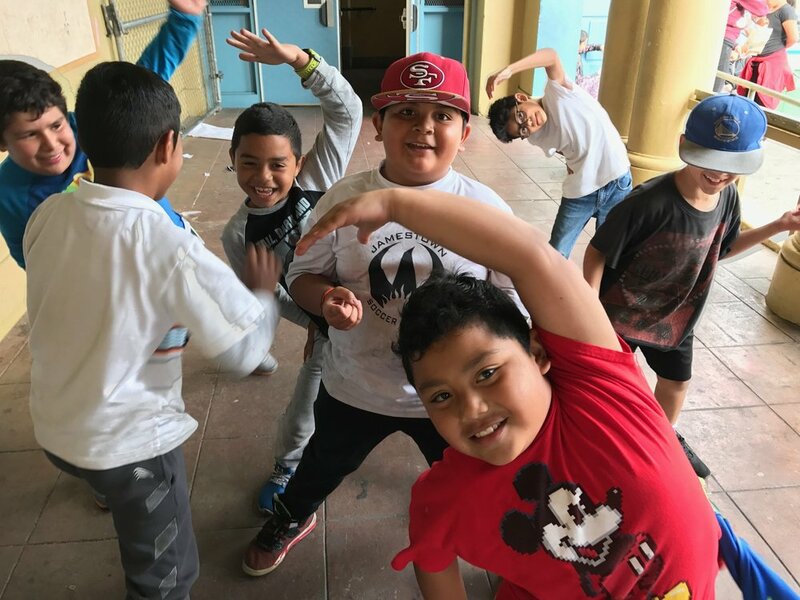 The third grade boys at Buena Vista Horace Mann K-8 named themselves the "Meditating Gamers" and learned about mindfulness through activities such as meditation, yoga and glitter calm jars (as seen in the photo to the right). Their credo: "Be kind, be curious, be thoughtful, be responsible." Jamestown’s afterschool programs are designed to infuse literacy into subjects as a way of engaging students’ diverse interests and learning styles to enhance successful academic development. Jamestown works in the following schools: Cesar Chavez Elementary School, Longfellow Elementary School, Buena Vista Horace Mann K-8 Community School, and James Lick Middle School. The after-school educational enrichment programs include cooking, media, science, Mariachi, theater, Loco Bloco (dance, drumming, stilt walking), Root Division (art), Streetside Stories, skateboarding, STEM, computer programming and robotics, skateboarding, Girls Got Goals (girls soccer), recreation, painting, Sports & Theory, Friday Clubs, Phoenix Games (math), tutoring, homework support, poetry, music, chess, and sign language. Our tutoring program focuses on English language acquisition and Social Emotional Learning skills, and our goal is to help English Language Learners achieve reclassification as English language proficient. We provide support to strengthen youth language acquisition through literacy infused enrichment at all our school sites. The goal is to expand this exposure to more youth in our afterschool programs and to provide training to school staff on restorative/transformative justice practices, habits of mind skills, and culturally and language-appropriate interventions. Si Se Puede offers the following activities…. Circle Time: After snack and recess, students gather for circle time. Teachers conduct bilingual, age-appropriate discussions that offer rich opportunities for language acquisition. Their teacher will write key words and concepts on a white board and help students decode the words. Interactive Read-Alouds: this technique of teacher-directed reading, highlighting key words has been proven to advance reading skills. Homework Help: With 4:1 student:teacher ratio, teachers and assistants provide intensive support to help students complete homework assigned by school-day teachers. Stations: Students engage in literacy infused educational activities, such as “turn and talks,” in which students articulate key concepts to their neighbors. Closing Circle: Literacy-infused guided discussion, similar to opening circle. Students choose among electives in science, cooking, media arts, art and drama, electives that infuse literacy, while appealing students’ unique interests. For example, the science class emphasizes new word decoding of and lab reports. In cooking class, students read recipes, create cookbooks, and present their cooking skills to their peers. Brain Soup students receive intensive homework support with the same 4:1 ratio. Click below to learn more about Each site.